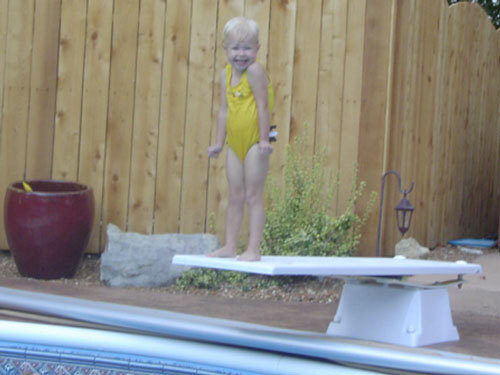 Diving Boards from Swim Shack Inc.
You don't have to be an Olympic diving champion to enjoy a diving board in your custom swimming pool from Swim Shack Inc. Whether you dive in to the deep end of the swimming pool or just jump in to make a splash in the pool, Swim Shack can include a diving board with your inground swimming pool. Many models of spingboards are available to add a splash to your swimming pool. The diving board shown in the photo above has a fiberglass base for low maintenance. This 6 foot model includes stainless steel hardware for corrosion resistance. The board has a sanded finish no-skid surface for safety. Kick off your flip-flops and jump into the pool. Diving boards can be great fun. As a family that grew up with a pool in our backyard (yes a Swim Shack pool), we've experienced fun splashing, doing cannonballs, figure 4s, and even diving in. As designers and builders of custom inground pools, we have to start with national standards for your pool. Safe diving requires us to consider not only the width and depth of the pool, but also the shape of the bottom, the location of equipment and pool features like ladders, ledges, stairs, and sundecks. Swim Shack Inc. has been building custom pools for more than 40 years. Call us at (630) 466-4853 to put the fun in your backyard pool! Look at our map to Swim Shack to find easy driving directions from Batavia, IL; Plano, IL; St. Charles, IL; Yorkville, IL; Plainfield, IL and other communities in our service area. To find out more dial Swim Shack at (630) 466-4853. Member of The Association of Pool and Spa Professionals.